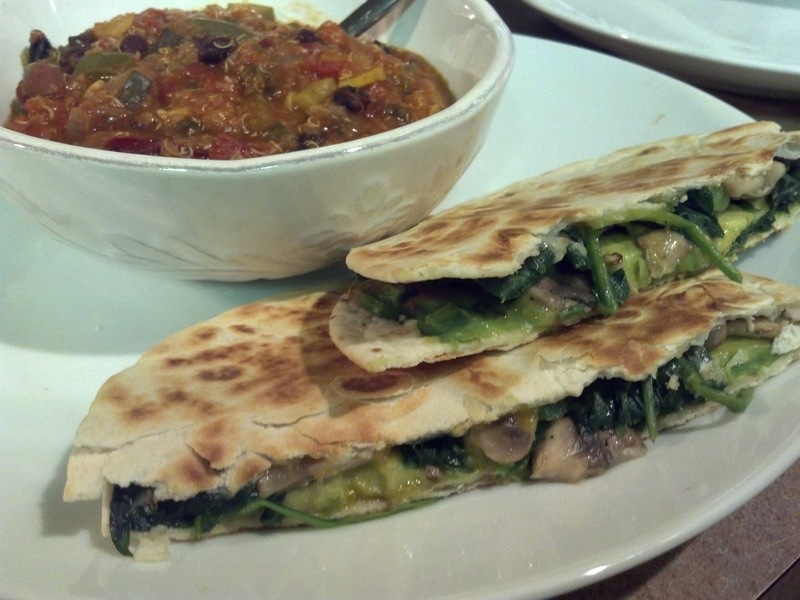 I served this very green quesadilla with my vegetarian chili with quinoa. I think the only way to make it more green is to use spinach tortillas… hmm… there’s a plan. 1. Heat a frying pan over low heat. 2. While the pan is heating, assemble the quesadillas. Place two tortillas on a plate or on your counter. Spread 1/2 of the two cheeses on each tortilla. 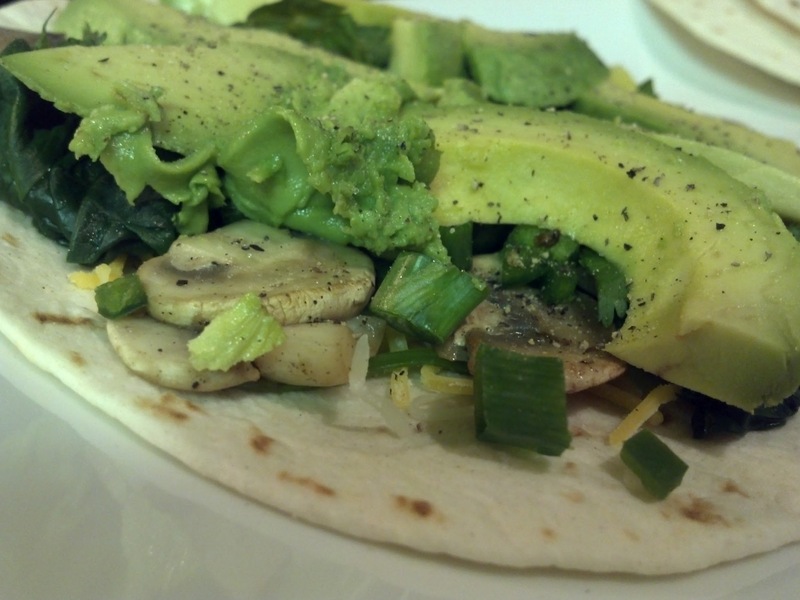 Split the spinach and mushrooms between the tortillas, topping with the jalapenos, scallions and cilantro. Next, top with the avocado slices, sprinkle with salt and pepper, and spread the remaining cheese over the top. 3. Slide the loaded tortilla into the frying pan (one at a time). Top with one of the unused tortillas. Press down with a spatula. Allow to heat until the bottom tortilla starts to brown. Carefully flip the quesadilla and cook the second side. Remove to a plate. Allow to rest a few minutes before slicing. 4. Serve warm, with salsa, soup or chili. Ingredients can be stored separately in the refrigerator. 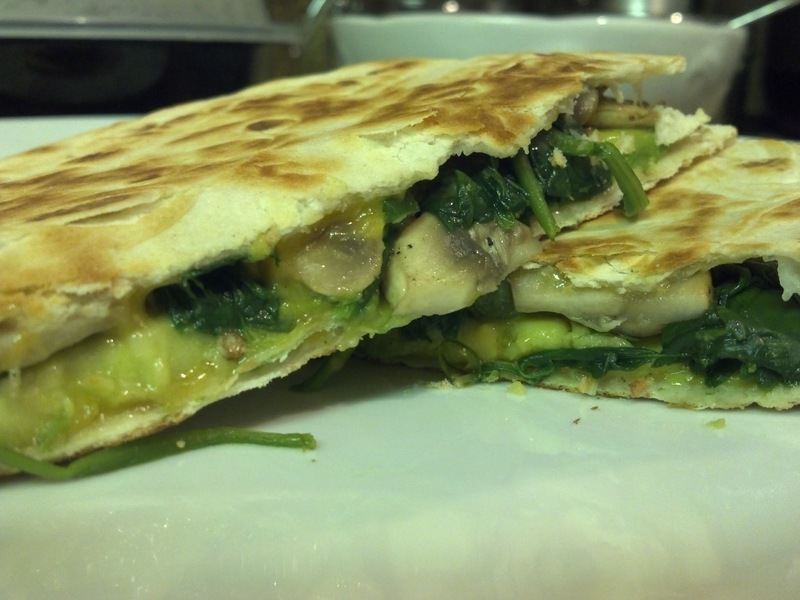 This entry was posted in Recipes and tagged avocado, mushrooms, quesadilla, spinach, vegetable quesadilla, vegetarian, veggie quesadilla by pondblog. Bookmark the permalink.